Tonga's parliament will sit today to elect a new prime minister. Two MPs vying for the role are the incumbent, 'Akilisi Pohiva, who is up against his former deputy, Siaosi Sovaleni. Siaosi Sovaleni and another minister, Tevita Lavema'au, were sacked by Pohiva just weeks before the King dissolved parliament that called for last month's snap election. Akilisi Pohiva's Democratic Party has 14 of the legislature's 26 seats, but commentators said the election could go either way if MPs cross the floor. Today, all MPs will elect Tonga’s next Prime Minister, the new Speaker of Parliament and their deputies. The new Speaker must be one of the king’s noble MPs, according to the constitution. Pōhiva implied that if his Party won the premiership, they would vote for a new Speaker. He said he no longer trusted Lord Tu’ivakanō after he had “badly advised” the king. “I and the PTOA have the numbers to decide who is our next Speaker,” Pōhiva said. 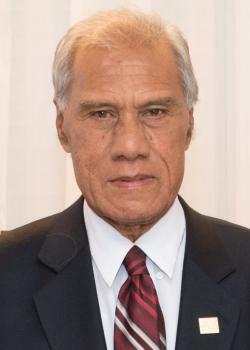 Pōhiva has praised Lord Fakafanua as a “brilliant” well educated young noble who had shown himself to be bright and clever when he became Speaker of the House in 2010. Meanwhile, Pōhiva said former Speaker Lord Tu’ivakanō’s advice for the king to dissolve Parliament had proved to be worth nothing. He said people understood what he was talking about and that was why they returned him and the Democrats to Parliament with an increased majority to Parliament in the snap election. “I am wondering what Tu’ivakanō would think of after the elections,” Pōhiva said. Pohiva said Parliament should replace Lord Tu’ivakanō today. King Tupou VI dissolved Parliament after he received advice from the Speaker of Parliament Lord Tu’ivakanō. At the time, Acting Attorney General ‘Aminiasi Kefu said the king had the prerogative to not explain why he had dissolved the House. Lord Tu‘ivakanō later released a statement outlining the reasons why he advised the king to dismiss the House. He said he was concerned Pōhiva and his Party were trying to remove some of the king’s power. Pōhiva said the king still held the power of veto to reject any laws the Parliament has passed. He said the proposal they had been about to submit to Parliament would have to have been signed by the king to become law. “If the king did not like those amendments he would not sign them and we would have to abide by his decision,” Pōhiva told Kaniva News. He said the constitution allowed any Tongan to submit any laws and the process was clear. They had to be submitted to the House to be discussed and if they were passed they had to be taken to the king to sign. If the king did not want that law to come into effect he would not sign it. “That’s why I said Lord Tu’ivakanō has given wrong advice to the king to dissolve Parliament,” Pōhiva said.